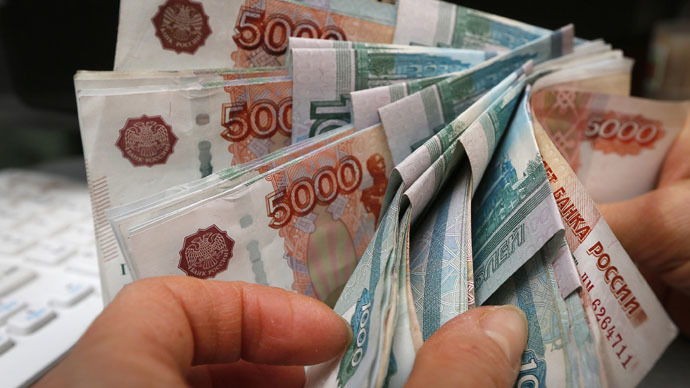 The Russian ruble has hit 55.3 to the dollar Monday, its highest value this year. The currency has become the best performer during the first three months of the year, after it finished 2014 as one of the biggest losers. The ruble gained above one percent against the US dollar, standing at 55.3 and at 60.8 to the euro at the closing on Moscow Exchange on Monday. Oil prices have been one of the drivers for the ruble’s climb through the day. Brent May futures rose to $56.36 a barrel, up about 3 percent on Saudi Arabia’s decision to raise its crude sale prices for Asia. WTI traded at $50.48 a barrel. Russia’s currency went from the world’s worst performer to the best in the first quarter of 2015, despite all the predictions, Bloomberg reported Monday. The ruble hit rock bottom against the dollar on December 16, when it lost more than 20 percent, with one dollar buying 80 rubles. It closed 2014 as the world’s second worst performing currency after the Ukrainian hryvnia. However, the Russian currency rallied 4.4 percent in the first quarter, even as the Bank of Russia cut its benchmark borrowing rate by 300 basis points and Brent crude traded at an average of $55.17 a barrel, 29 percent lower than in the previous three months. Last week, the ruble hit a 3-month high, improving more than 3.6 percent in 2 days. A variety of factors influencing the ruble makes it “one of the toughest jobs” in financial markets to predict the ruble, Bloomberg added. It also pointed to the ceasefire in Ukraine as a main determinant of the Russian currency’s behavior. However, economists stay divided about the Russian currency’s future - while some forecast a slump on declining oil prices, others say the ruble gains of the first quarter will likely continue. “None of my expectations regarding the ruble came true. This is our new reality - there are too many different factors affecting the ruble, there are too many elements in the ruble matrix. The ruble is completely unpredictable”, the head of trading at Veles Capital LLC in Moscow, Evgeny Shilenkov told Bloomberg. Economists recently started reviewing forecasts for the Russian economy as well. Last week, US bank JPMorgan’s forecast for Russia’s GDP for 2015 improved from a reduction in 5 percent to a 4 percent fall. Economists from Russia and the US agreed last month that the Russian economy had recovered from the worst and praised it as an ‘underrated land of opportunity’, adding that Western economic sanctions had no “discernible effect” on it. In February, the ruble-denominated MICEX was also named the best performing index of the year by analysts, expecting the growth streak to continue. Last year the ruble closely mirrored oil prices - with the oil benchmark losing 50 percent of its value in the last six months of 2014, the ruble lost about 44 percent. The ruble is currently doing better than Brent crude.